Well, what a Liberal wave! Even the most optimistic projections didn't have the Liberals over 180. It wasn't a very good night for me (in terms of projections, not saying anything about the result itself) and I'll have to look into it. But it doesn't look good, there is no way around it. When I wrote my final projections analysis, I said that while the poll average was showing a Liberal minority, they were essentially three possible sources of error or uncertainty. 1) Is the last minute momentum for the Liberals (seen in the very last Forum and Nanos) as well as the collapse of the NDP real? It turned out it was, especially in Quebec 2) Will the Conservative be underestimated? They were, slightly (one of the few successes for me last night!) and 3) What about Quebec? The race was so tight that pretty much anything could happen. And what happened is a collapse of the NDP. For now, let's look at the polls and how close they were. Some did really well, others were quite off. I calculated the average total absolute deviation. For each party, you take the absolute deviation as the official results minus the voting intentions in the polls, you sum it over the five parties and you average. I also calculated how many parties were within the margins of error for each poll. This is indicated by the color. As we can see, the averages (adjusted or not) did better than most of the polls except the very last two. This is quite rare that the average doesn't do significantly better than the polls and this is really because of what appears to be a last minute collapse of the NDP with its voters going to the Liberals. By the way, my adjusted average had the Liberals slightly too low, but notice there are the same (or partially the same) Nanos poll twice here. If we count it once, the unadjusted was 37.1 and I was really close. My adjustments were really to boost the CPC a little bit and to decrease the Green and Bloc. All three were going in the right direction and made the adjusted average better. I admit I'm usually skeptical of such last minute trends but it seemed to have been the case yesterday. Notice however that Nanos didn't have the NDP 10 points behind the Liberals in Quebec in its last poll. But I'll add the provincial comparisons later. So bottom line, the very last polls got it right. Nanos got all five parties within the margins of error, although these were pretty wide given the small sample size. Still, very impressive. Forum did also very well and I hope it'll finally stop people from always thinking they are a bad firm. Forum also got most of the provincial numbers right, but I'll add to this later. By the way, Mainstreet did well for the average total error but terrible for the number of parties within the margins of error. This is because of the insane sample size they had. So, should we always only use last minute polls? I don't know. It's very risky to base the analysis entirely on 1 or 2 polls with small sample sizes. But it would have worked a lot better yesterday. Although Quebec, one of the biggest surprises of the night, would still not have been right as even last minute polls had the NDP much closer to the Liberals than what happened. So polls did pretty well yesterday, at least at the national level. However, it shows that even small deviations (like for the NDP) can have dramatic impacts on the seat projections. You get one province wrong (like Quebec) and you are off by 20 seats. I'll add later this week the analysis by province. Here is the list of ridings where there is uncertainty. Specifically, I defined them as ridings where the winner was projected with less than 70% chance of winning. So that includes all the 2, 3 or 4-way races out there. And by experience, once your chances are above 70%, the model makes few mistakes (logically, duh). There are 58 of them. As you can see, in most of the ridings, there is little to no uncertainty. You can find them here or below. En ce lundi 19 octobre, les Canadiens vont très probablement élire un gouvernement Libéral minoritaire. Il y a cependant assez d'incertitude pour que d'autres scénarios soient possibles, tel qu'une majorité Libérale ou une minorité Conservatrice. Je ne compte pas ici faire un copier-coller de mon article en anglais. Je vais plutôt me concentrer sur le Québec. Sachez simplement qu'une minorité Libéral est de loin le scénario le plus probable. Viennent ensuite une minorité Conservatrice (environ 18% de chances) et une majorité Libérale (environ 10%, bien que cela pourrait être davantage si vous croyez les sondages de dernière minute indiquant une tendance favorable aux Libéraux). Le Québec est maintenant une course à 4. 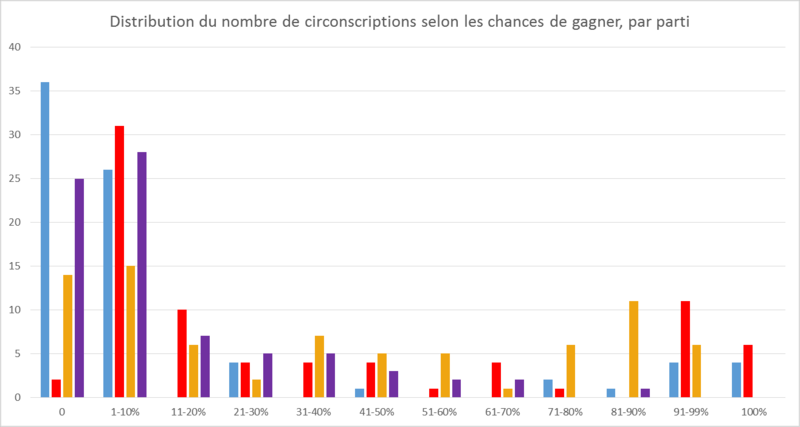 Les Néo-Démocrates sont favoris pour remporter le plus de sièges (58% de chances que cela arrive) mais les Libéraux ont leur chances. Tout comme, en théorie, les Conservateurs et le Bloc. Cependant, pour ces deux partis, les chances sont vraiment minces et demanderaient des erreurs majeures des sondages. Les sondages n'arrivaient pas vraiment à se décider au Québec. Certains sondages ont le PLC devant à plus de 30% et le NPD 2e à seulement 25%, alors que c'est l'inverse pour d'autres. Pour les Conservateurs et le Bloc, les sondagent alternaient entre 17% et 24%! Tout cela fait en sorte que le Québec est relativement imprévisible. À l'inverse, mon modèle avec coefficients régionaux marche en général mieux au Québec qu'ailleurs. Le Bloc va très probablement faire des gains par rapport à 2011 tout en récoltant moins de votes. Le mode de scrutin et la lourde chute du NPD engendrent ce résultat. Gilles Duceppe est très proche dans son comté, mais il n'est pas favori. Le graphique ci-dessous vous montre pas mal tous les scénarios possibles si l'on tient compte de l'incertitude des sondages ainsi que du mode de scrutin. Le premier histogramme vous montre la distribution des sièges pour chaque parti alors que le second illustre le nombre de circonscriptions en fonction des chances de gagner. Comme vous pouvez le voir, les distributions s'entrelacent beaucoup. Les Conservateurs sont très concentrés alors que le NPD et PLC sont les plus dispersés. Pour le Bloc, la soirée peut se terminer en beauté avec 20 sièges ou en catastrophe avec zéro! Remarquez les courbes PLC et NPD pas mal plates et ainsi ayant beaucoup d'incertitude. Ici on voit la concentration du vote Libéral et Conservateur. Ces deux partis ont en effet pas mal de comtés assurés (alors que le NPD n'a en fait aucun comté assuré à 100%, ce qui était impensable il n'y a que 4 semaines de cela), mais à l'inverse, le PLC et PCC ont moins de sièges probables. Au final, il se peut que le NPD bénéficie du mode de scrutin pour une fois (il en avait déjà profité en 2011 au Québec mais ce pourrait être encore plus visible lundi soir). Personellement, je crois que Thomas Mulcair joue sa tête au Québec. 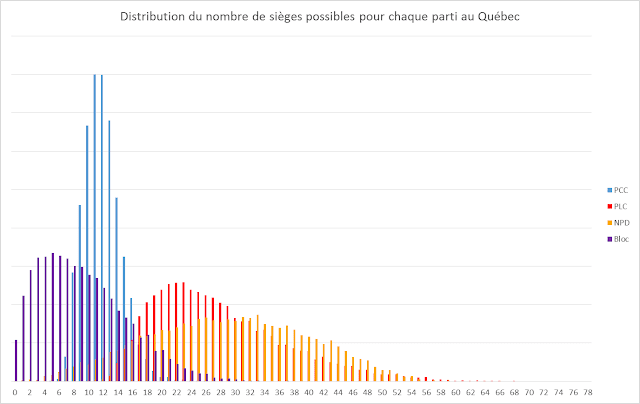 Si son parti sauve 35-40 sièges, cela pourrait être suffisant pour conserver son poste. Mais s'il devait perdre "sa" province, je suis sûr que sa position serait très précaire. After the longest campaign in Canadian history, it appears voters have made their choice and will elect a Liberal minority on Monday. There is however enough uncertainty for a surprise to happen, whether it's a Conservative minority or a Liberal majority. This will be a very long post. The first part is the summary and then you have the detailed analysis. So for those who don't like to read, here are the final projections. These projections are really my best guess for tomorrow. Given past election results, the multitude of national and riding polls and how accurate polls can be, I get that Justin Trudeau has about a 82% chance of becoming the next Prime Minister. I should probably phrase it more as "winning the most seats", but it'll ultimately be the same. So another minority, but most likely a stable one for a while as both the Conservative (for sure) and the NDP (I predict it'll be the case) will be looking for new leaders. I think for Thomas Mulcair, it depends on the extent of the loss tomorrow. 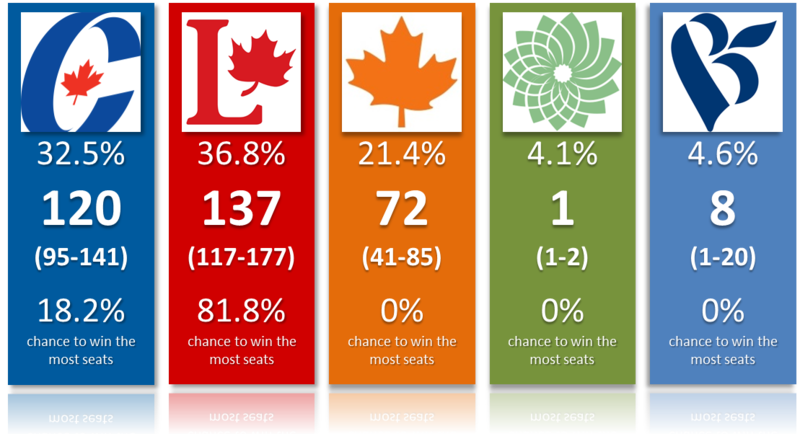 72 seats isn't too bad, especially if they keep Quebec. But it could also get ugly. According to polls, the NDP is actually down in every single province or region! You have the riding by riding projections (with chances of winning for each candidate) below. You can either click here or use the Scribd thingy (if you are on mobile, avoid Scribd at all cost). All in all, the big picture take-away from these numbers is that a Liberal minority is by far the most likely outcome that can occur tomorrow. But odds show a Conservative minority is possible as well as a Liberal majority. I know it sounds like I'm trying to cover every possible scenario so that I'll at least have the correct one, but it's more about putting odds on those scenarios. The same way that when you go to the casino, you know you can win, but you also want to know how likely you are to become rich. Remember that polls and projections have a lot of uncertainty. It's important to reflect this uncertainty the best possible way. Still, don't get me wrong, anything but a Liberal minority tomorrow would be a big surprise and a punch to pollsters and people making projections like me. If you are interested in more details and analysis, then please keep reading. Still, it's far from a sure thing. How is that? Well first of all, I slightly adjust the polls to account for the likely underestimation of the incumbent, This is a phenomenon we have observed in multiple elections, including the last 3 federal ones. You can also see this as accounting for the so-called "shy tory" effect where people are too embarrassed to admit they'll vote Conservative (what might have happened in the UK earlier this year). Additionally, we need to remember the Tories usually do better among older demographics and they tend to vote more (although Ekos and Forum actually show the Liberals ahead in every age group). My adjustments are relatively small and boost the Tories by 1.5 points compared to a simple poll average. They are definitely smaller than the adjustments of others or what we've seen from Angus Reid with the Likely Voters adjustments. Is it a good assumption or should I go with the 3 points of last time? Or maybe even more as Conservative voters might feel even less likely to admit who they are voting for. Ekos for instance note that the Conservatives are lower in phone polls with live interviewers (aka a human person) versus automated phone calls. At the end of the day, this is the part where this becomes more of a guess than anything else. Another illustration of the possible underestimation of the Tories come from the numbers among people who voted in advance. Ekos actually show the Conservatives ahead while Angus see them neck and neck. When I looked at patterns between the turnout and other variables, I didn't find much. Abacus also concludes that people who voted by anticipation do not significantly differ from others. Still, it shows that even though these advanced polls took place right when the Liberals were surging, the Tories were still in the game. As I said before, Liberal supporters need to remain cautious, their party hasn't won yet. All in all, I'm pretty convinced the Tories are indeed underestimated. But by how much? Well your guess could be as good as mine. I think whatever boost they'll enjoy could ultimately be canceled out by the last minute momentum of the Liberals and the possible switch of some NDP voters (see below). However, it's really important to realize that if the polls are underestimating the Conservatives as much as they did in 2011 (especially in Ontario), then Stephen Harper could well win more seats tomorrow. This is a possibility we need to acknowledge. The chances of a Liberal majority are actually smaller than of a Conservative minority. That should put things in perspective. Yes it's possible and last minute, one-day polls of Forum for instance show the trend is in favour of the Liberals, but the average doesn't. Still, if we allow for the possibility that the Conservatives will be underestimated, we need to do it for the Liberals as well. In order to win 169 seats and more, Justin Trudeau would need to finish first in Quebec in terms of votes, clean Ontario and win BC. Possible, but unlikely. One thing for sure, the last minute trend was incredibly favourable to the Liberals. 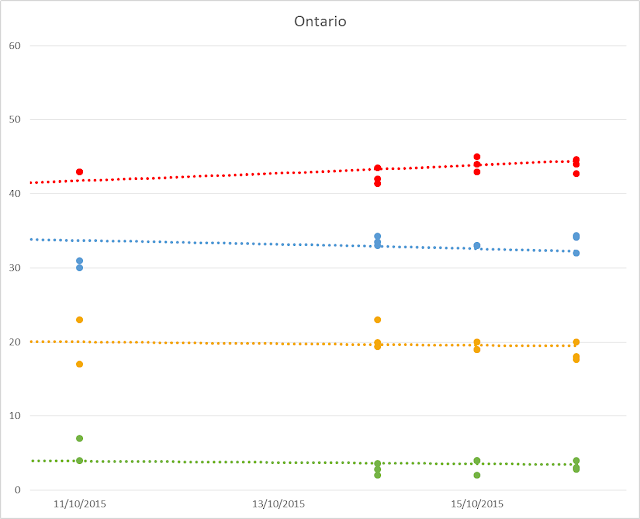 Nanos shows the Liberals increasing over the weekend, so does Forum and Ekos. So if you believe that one-day polls done during the weekend can accurately measure last minute shifts (I'm skeptical and prefer averaging over a couple of days; I also tend to think pollsters love using the last minute shift as an excuse when they're wrong), then you should actually prepare for a Liberal majority. Not that the Tories are collapsing, but the NDP sure is. The exact chances of a majority depend on how we model uncertainty (see below for the technical discussion). It's between 3.2% and 17.9%. I thus went with the average, middle of the road scenario for the pdf above. The reason I believe a majority is out of the question for the Liberals is because even the last minute polls don't show a much larger lead in Ontario. The surge seems to be coming from elsewhere. But Ontario is really the key to a majority for the Liberals. 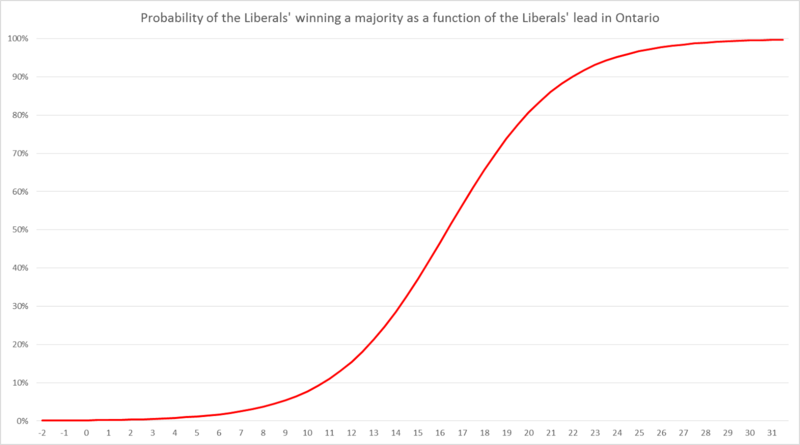 Here below you have a graph representing the probability of a Liberal majority as a function of the lead (in percentage points) in Ontario. As you can see, the Liberals start having a chance around 15 or 16 points. Polls haven't shown the lead to be that wide in average. Of course, the Liberals could win Ontario by "only" 11 points and do better in Quebec and BC. I'm simply showing one of the key determinants here. It's a simulation and you can take from it whatever you want. It's possible that this issue will occur for the last time as both the NDP and Liberals want to change the electoral system (although they don,t currently agree on which system is better). And now some remarks and analysis by topics. 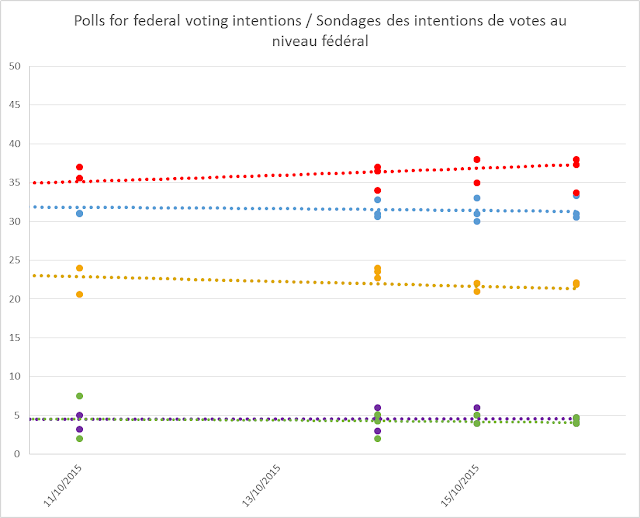 As usual for a federal election, we got a lot of polls. Every major firm provided numbers in this last week, some even multiple times over the weekend. Only Abacus strangely decided not to release final numbers. These polls have shown a remarkable convergence. Even Ekos who had a tight race just two days ago ultimately showed the Liberals up by around 4 points. This is very similar to the latest numbers from Angus Reid. The rest, from Nanos, Leger to Forum (and others) all have the Liberals well ahead of the Tories. Not only is this true at the national level, it's true in the crucial Ontario where Justin Trudeau appeared to have taken the lead during the first week of October. We also got a lot of riding polls. Some matched my projections exactly, some didn't. I had more success with polls from Forum and Mainstreet than the ones from Environics in general. When the differences were too important (and especially when they were confirmed by more than one poll), I adjusted the projections. I covered this in details in my article yesterday for the Huffington Post. The Atlantic provinces won't be the source of much uncertainty tomorrow. The Liberals should pretty much sweep the region. The Liberals will therefore take a very early lead in the seat count on your television (or Ipad, you crazy kids). There is really nothing much to say there. The Liberals have been ahead in this region the entire campaign and their lead actually increased. Quebec is possibly the most unpredictable province. After weeks of dominance by the NDP (where, at some point, we wondered if the NDP would not be able to win over 70 seats there), the niqab happened and started the downward trend. Thomas Mulcair never managed to recover. As of tonight, we can't even be sure the New Democrats will finish first in Quebec, both in terms of votes and seats. 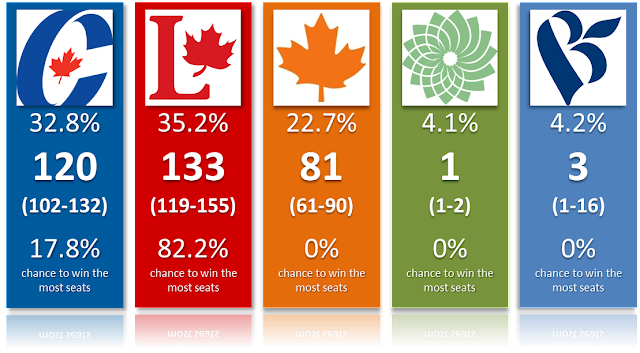 The electoral system and the fact that the Bloc appears to be stuck at 20% or less in average means the NDP is likely to win the most seats though. The chances are 58% to be precise. The NDP could finish second in votes and still win more seats. Look at the detailed analysis in French. Note that technically, all four parties have a shot at winning Quebec! If polls have shown a convergences in Ontario, they definitely haven't in Quebec. The Conservatives seem poised to at least make some gains in Quebec, thanks to the drop of the NDP and a small increase compared to 2011. It won't ultimately be enough to compensate the losses pretty much everywhere else. As for the Bloc, well, this is kind of the wild card. Its confidence interval is quite wide (relatively) and, by being around 20%, is right at the threshold between winning many seats or losing them all. Even Gilles Duceppe isn't sure to win his riding. Ontario is ultimately the reason Trudeau will likely become Prime Minister. 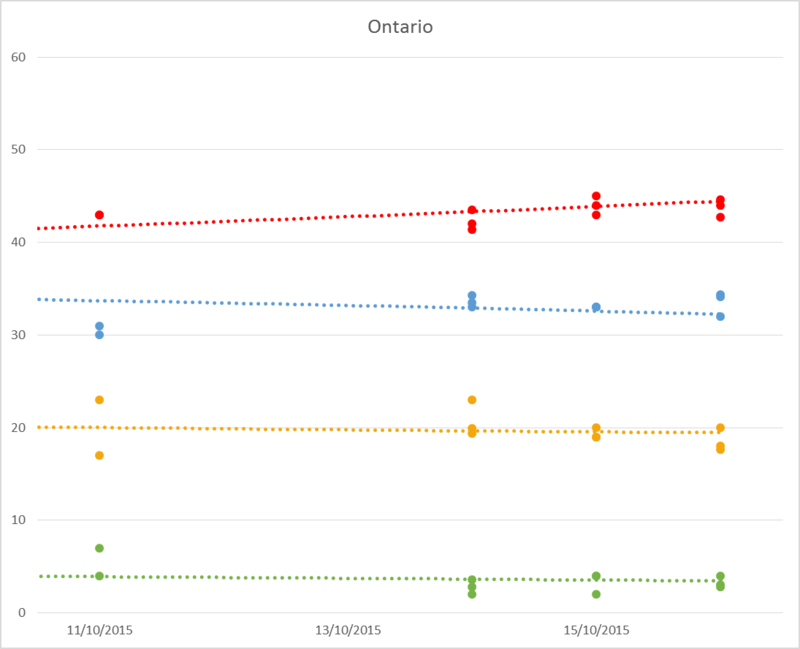 If you look at the graph, you actually see the Tories increasing in most provinces over the last two weeks, except in Ontario. 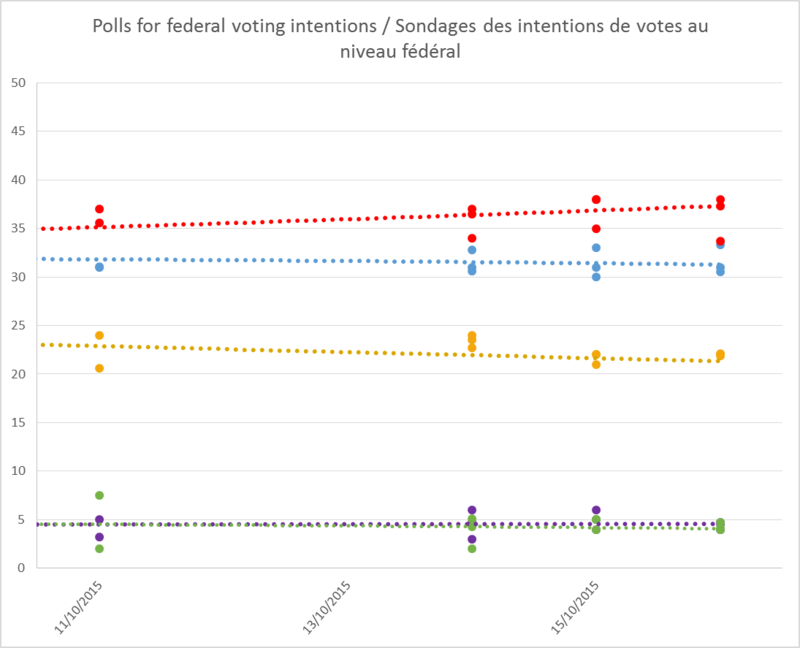 Not sure what happened there in early October but there was a sharp shift in the voting intentions.We moved from a tight race between the Tories and Grits to a situation where the Liberals were enjoying a comfortable lead. In this last week, the trend has been very constant and this is the main reason we don't think a majority is really likely for the Liberals. The Prairies and Alberta are still Conservative in majority but the Liberals will definitely make gains there. This is especially possible in Manitoba and in cities in Edmonton. As the NDP was falling in Quebec and its chances were going away, it appears some voters switched to the Liberals in order to defeat Harper. 4. Could the Conservatives win when almost 70% of the population don't support this government? The Conservatives won a relatively surprising majority last time. I say surprising because polls and projections were mostly predicting a minority. But a 2-3 points underestimation nationally and a 3-4 one in Ontario allowed Stephen Harper to win his majority. He even won seats in Toronto, something that was definitely the biggest surprise of the night. This time around, his support was always gonna be stable but limited. Stable because at barely over 30%, he only has the core Conservative voters left. This matches perfectly with the around 30% of people who like Stephen Harper, think he's doing a good job and don't want to change government. Limited because many voters really despise him by now and would go as far as voting strategically in order to defeat him and his party. The ceiling for the Tories has been low for a long time now. Ultimately, the only way he was gonna win was by having the other two parties splitting each other. Such vote splitting still occurs in some ridings (see above), but the Liberals have managed to gather enough support around them (and/or the NDP collapsed enough) to win anyway. Stephen Harper also wanted the voters to mostly think of the economy and not take a chance with the other guys. But it appears that values could play a bigger role this time around, as shown by the latest Ekos and Abacus polls. Plus, of course, the fact that 60-65% of people have consistently shown they wanted a change of government. If you think about it, it's still pretty surprising the Tories are even in this race and they can thank the electoral system for that. The chances for the Tories depend on how you model uncertainty. I get the probabilities by doing simulations where I randomize the vote intentions (to account for the possible errors of the polls) as well as the distribution of the vote (to account for the fact the electoral system doesn't translate votes into seats perfectly). The idea is really to see all the possible outcomes and how likely they are. So a good case scenario for a party is when it beats the polls and has an efficient vote. The question is whether we should add correlation across provinces. For instance, if the Liberals out-perform the polls in Atlantic, are they more likely to outperform them in Alberta? The answer isn't very clear, so I did both. Adding correlation means that a party could be fortunate and do better pretty much everywhere. So I ran the simulations twice, once with correlation and once without. Without, I find the odds of a Conservative victory to at 10.6%. With, they increase to 25%. Ultimately, I believe the truth is somewhere in the middle and this is what the graphic above displays. Also, my simulations have proven to work remarkably well at the riding level (and this part doesn't depend on cross-province correlation). After 4 elections using the model (BC 2013, Quebec 2014 - and 2012 retroactively, Ontario 2014 and Alberta 2015), here where it stands. As you can see, it works. So if your favourite candidate is projected at 0% in my final projections, I'm sorry but the odds are that he or she will lose (note: because I round the numbers, some candidates appear at 0% but are not. If they are at like 0.5%, the pdf will at least show some color on top of the percentage). Similarly, anybody projected with 100% confidence level should win tomorrow. Therefore, maybe a better way to look at the race tomorrow is to see how many ridings each party is guaranteed to win and how many close races there are. None for the NDP or the Bloc. For the NDP, this is pretty insane. Just a couple of weeks ago, this party had half the ridings in Quebec completely locked up. If people will likely remember this election as Trudeau's triumph, we should also remember it was Mulcair's spectacular failure. How many ridings are at 0.0% and therefore completely out of reach? Let's this information sink for a moment: there are only 25 ridings where the Liberals have no chance at all. This is incredibly impressive and shows how widespread this party's support is. Finally, for each party, the number of seats currently projected as a loss by less than 5 points. See for the Liberals, this means they could actually get quite a lot higher than my projections. It really depends if the last minute shift observed by some pollsters will translate into actual votes on Monday. More generally, here are the distributions of the chances of winning by parties. Obviously gonna be a long day for me. Waiting for the latest Ipsos and possibly Forum. Even though polls seem to all show a significant Liberal lead (except Ekos), the "issue" of vote splitting still exists. There still are two parties (NDP and Liberals) splitting essentially the same "Don't want to vote for Harper" electorate. It doesn't mean these two parties are identical or should merge, it simply is a reality of the electoral system. After all, the Conservatives are still in this race, albeit with lower odds, despite an overwhelming majority of Canadians not satisfied and wanting change. I already did the analysis a couple of weeks ago, but the Liberals' surge of the last two weeks requires me to do it again. Here's how I proceeded. First of all, I gathered the second choices in multiple polls. They don't all provide this information but Nanos (every day), Ekos (sometimes) and Leger did in their recent polls. I then averaged these second choices and adjusted for the fact the Bloc can receive second votes in Quebec only. Here below you have the second choices for Quebec and the ROC. I then used my most recent projections and look at how many ridings were in a situation with CPC first, but NDP+LPC would be greater. There are currently 60 ridings in this situation. This is less than the 72 of last months, but more than the 41 of 2011. In these ridings, I thus removed the lower candidate between Liberals and New Democrats and I redistributed the votes (so no controversy in this exercise!). This means 17 Liberals candidates withdrawn and 43 NDP. See this as a what-if situation where the two parties would make a deal to run a unique candidate in some ridings. Quite often people forget that even though the NDP and Liberals voters have each other as their main second choice, it's not 100%. Many voters would switch to a different party or not vote at all. Therefore, it's completely unrealistic to expect to regain all 60 ridings. The Liberals would be very close to a majority while the Conservatives would be third and with no chance of winning. Of course, as usual, I completely realize it could be very different if that were to happen in real life. In particular, the second choices used are very hypothetical and could be non representative of how the voters in these ridings (or in general really) would react. Moreover, I can't really see the NDP agreeing to withdraw 43 candidates while the Liberals only do the same 17 times. Still, I do my best with what I have. Notice that out of the 60 ridings where theoretical vote splitting is occurring, only 34 would be reclaimed. So really, vote splitting is an "issue" in 34 ridings max right now. The good news for people really worried about this and considering voting strategically? Both the Liberals and New Democrats want to change the electoral system. A proportional system would make vote splitting a non issue. As we are approaching election day, polls are confirming the Liberals are ahead. While it's far from a sure thing, the projections are now quite confident Justin Trudeau will become prime minister on Monday. With that said, polls are never perfect and can sometimes be very, very wrong (hey, remember Alberta 2012 or BC 2013? or the recent UK election?). Here are some reasons why we could think the polls are wrong and people need to remain cautious. Please note, I'm NOT saying polls are wrong, just reminding that they can. And no, I'm not trying to preemptively find excuses as to why my projections could end up being wrong Monday evening. I have yet to follow/cover one election where polls got it perfectly right. Earlier this year in Alberta, pollsters were congratulating themselves for correctly calling a NDP majority. They indeed did, but they also overestimated the NDP by 2-3 points and underestimated the Progressive Conservatives by 3-4 points. This means the NDP-PC gap ended up being roughly 6 points smaller than predicted. It didn't matter in Alberta because the NDP's lead was massive. But such a mistake on Monday and Stephen Harper remains PM, at least for a while. Similarly, if polls were as wrong as in 2011, there as well it'd most likely prevent Trudeau from winning. I personally believe the Tories are underestimated for multiple reasons. They are the incumbents and incumbents are almost systematically underestimated. They were also massively underestimated by the polls in 2011, especially in Ontario. I'm not saying it's likely the CPC will be 4 or 5 points above the poll average, but I wouldn't be surprised if they were 1-3 points above. This is why in my projections, I make small adjustments which result in a 2 points boost for the Tories. In other recent elections, polls almost always made some mistakes. In Quebec in 2014, the Liberals were underestimated by 1-2 points and the PQ finished 2 points below the average. Still in 2014, the Ontario election saw the surprise majority win of Kathleen Wynne. In this case, polls were especially wrong and overestimated the PC with their likely voters adjustments. Only Angus Reid is offering such a LV model this year, but it remains that polls are always 1 or 2 points off. Yes aggregating polls provide lower margins of error, but this only corrects for sampling variation. Measuring vote intentions is prone to more error than this. People can change their mind, they can lie, or they can simply not vote. For this Monday, any small error by the polls in Ontario could drastically change the outcome of the race. The differences range from a Liberal majority to a Harper victory. 2. People who vote are different from the general population. And people who answer polls are also different. Polling firms sample from the general population of adult citizens. In the case of online panels, they actually sample from the panel. And in order to be on this panel, you need to volunteer. While I don't have a problem with online polls and find them reliable (and results speak for themselves), it remains that turnout can massively affect the results. One big determinant is the age, with older citizens voting in much greater proportion than young people. However, polls weight their samples based on census data. What this means is that if the 55+ represent 20% of the population (a number I just made up), they'll want their observations from people aged 55 and over to represent 20% of the sample, after weighting. But given that the turnout among people aged 55+ is much greater, you see that this could cause some problems. In BC for instance, around half of the voters are above 50, a proportion much greater than in the general population. This is the typical answer used to justify the failures of the polls in British Columbia in 2013. I'm half convinced but I acknowledge this is a potential issue. Look at the voting intentions by age in some of the most recent polls, you usually see the Conservatives winning the 55+ crowd (I say usually because pollsters don't all seem to agree). So if this age group votes a lot more proportionally than the other age groups, the results will be closer to their vote intentions. It's only one of the multiple dimensions where something like could occur, but you get the idea. When Angus Reid does its Likely Voters model, they try to specifically account for this. After all, you have to wonder why pollsters weight based on the census instead of on the demographics of voters. At the same time, as I've said, LV models made the numbers worse in Ontario last year... So no model is maybe better than a bad one? People also need to realize that people who answer to polls are not the same as people who vote and/or the general population. Just look at the Angus Reid poll where we learn that 34% of respondents have already voted, even though the actual turnout was below 15%. We always get that, with like 90% of people answering polls saying they will vote. Of course, a lot of people don't want to admit they don't vote but it simply shows that we can sometimes simply poll or ask the wrong people. By the way, both Angus Reid and Ekos have the numbers among people who already voted. Angus has Liberals and Tories at 34% while Ekos has the Conservatives at 34.9% and the Liberals at 32.5%. Of course this is mostly due to the fact that advance polls are for more committed voters (a group where the Tories have the edge). Still, it shows at least two things: 1) despite a surge in the turnout, the Tories are actually ahead 2) if only the more committed voters go out and vote, Stephen Harper still has a chance. Let's remember in particular that advance voting took place during the Thanksgiving weekend, when the Liberals were surging and most likely at their peak in Ontario. See? The Liberals can win but they need the people saying they want to vote for them to actually, you know, go out and vote for them. I know the Liberals and Trudeau have taken a lot from the Obama campaign in trying to mobilize younger voters, we'll see on Monday if they were successful or not. Despite a lot of hard work, there is no denying that seat projections models aren't perfect. Not only do they rely heavily on polls, they make mistakes even with the correct percentages. You always have surprises, candidates who perform better or worse than expected, local effects, etc. They are usually rare but you never know. The CAQ somehow managed to win pretty much every single close riding in the Montreal suburbs last year, against all odds. This year, if the Tories can resist in key parts of the GTA, they could well create an upset. At the same time, errors go both ways and the Liberals could surprise us with a majority (the projections actually show it's possible). So we'll see, but this post is simply to remind everybody that despite a lot of polls and pretty much every projection model showing the Liberals ahead, it doesn't mean the win is guaranteed. Just ask Christy Clark in BC. Thanks to a bunch of polls confirming the large Liberals' lead (although Ekos yesterday kind of decided to ruin the party), the projections now have the Liberals ahead. Make no mistake though, it's still a race between them and the Conservatives. We'll soon have the final polls of most firms, but if the situation remains like this during the weekend, it's going to be incredibly hard to make a final call on Sunday. Here below are the most up to date projections (sorry, I haven't updated in like 203 days, mostly because I didn't really have new polls to add). Detailed projections are available here. So, why the change? After all, most other models have had the Liberals ahead for a while, some are even giving the Grits enough seats to put them relatively close to a majority. Well, first of all, I add Nanos and Ekos every three days (one Nanos today, Ekos later this afternoon). So while the narrative can be driven by three successive Nanos polls showing a 6 points lead for the Liberals, my numbers can remain unchanged. 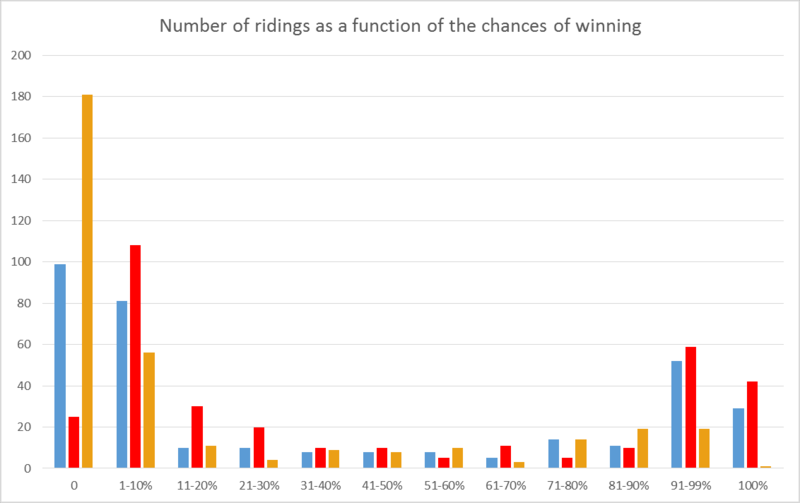 Also, some riding adjustments were made based on the most recent riding polls. In particular, the Environics ones showed big gains for the Liberals in Ontario. Speaking of Ontario, some polls now have the Liberals with a 20-points lead! Something definitely happened in this province last week. Not gonna try to guess what, but the impact is that Justin Trudeau can now win the seats he needs there. Once again, nothing is guaranteed and the recent trend according to Nanos (or Ekos) is for the race to become tighter. I really, strongly disagree with anyone calling this race a sure Liberal win at this point. The Liberals might be peeking at the right time, they haven't won a minority just yet. A slight underestimation of the Tories in Ontario for instance and Harper at least gets first crack at forming the next government. In Quebec, the NDP is now second for the first time in my average, which coincides with Nanos putting them behind the Liberals for the first time today. On the other hand, Ekos yesterday had them comfortably ahead (but I'll add a new Ekos poll today). Speaking of which, I made some minor tweaks because I had the model showing the Bloc with a 95% interval of 1-12, yet only 1 seat in average. In other words, the Bloc was losing almost every single close race he was involved in with the NDP. The adjustments are minor but were necessary to reflect the fact the NDP is far from being as dominant as it used to be. Specifically, Thomas Mulcair now "only" has a 80% of winning the most seats in la Belle Province, compared to 20% for the Liberals. BC remains the only true 3-way race in the country and I think it's becoming very likely that we'll have to wait for this province before calling this election. I guess some media won't be happy or simply won't care and will still call it with only 3 ballots from Ontario. Notice that the Liberals could thus win the Atlantic (all four provinces), Quebec (in votes, not seats), Ontario and BC. Quite a contrast to only 2 weeks ago when Justin Trudeau was only dominating the Atlantic. And my simulations now show a remote possibility for a Liberal majority. I'll try to update frequently between now and Monday morning. I'm sure we'll get a lot of polls from every major pollster. It's gonna be very interesting in particular to see if Abacus and Angus Reid also show the Liberals ahead. And if Ekos keeps showing a tighter race than the other pollsters. Strategic voting, that thing you say you'll do even if you have no idea how! Because you know, if a journalist asks you if you are considering voting strategically, you want to sound smart and aware of the situation and will therefore answer that yes, you are totally voting strategically. I'm really glad to see that 80% of the population will do it as I'm sure these people read projections daily and that will make me rich. The problem? It requires a lot of information and coordination. If you want to make recommendations, you need to identify the right ridings and then convince enough people to switch to the other option. In this election, it mostly means voting for the "right" candidate between the Liberals and NDP in order to defeat Harper (even though I'd argue that Conservatives voters can also do it, especially now with the Liberals possibly ahead, but that's another story). One of the leading (no pun intended) organization for this is Lead Now. They went as far as polling key ridings, mostly to avoid making recommendations in the wrong ones and doing more harm than good (for their cause) like what happened in 2011. So you go on their website and they'll tell you if you live in a riding where you shouldn't simply follow your top choice but instead vote strategically. For the record, I see no problem with people voting strategically, absolutely zero. People are free to vote for whoever they want for whatever reasons they want. I find it incredibly condescending when we try to tell people that they are "wrong" or vote for the "wrong reasons". On top of this, I have no problem with organizations making recommendations. Heck, I myself wrote, weeks ago (so it's not valid anymore) a "guide" to strategic voting. But when I did, I set some clear rules and guidelines. I only looked at ridings where the top two candidates were close to each other. Mostly because I don't believe movements like this one can really convince many voters (honestly, if it was easy to swing 10-20% of voters, political parties would do it already!). Plus, I only included a riding on my guide if the third party was really far behind and had almost no chance. Also, I didn't only look at ridings where the NDP+Liberals could beat the CPC because, as opposed to most of these organizations, I have no agenda there. What am I talking about this? Because Lead Now made an official recommendation in Vancouver Granville: people should rally behind the NDP candidate, Mira Oreck. What's the problem you're asking? Well, there are a couple. First of all, the last two riding polls, including the Environics ones done for Lead Now, actually shows the Liberal candidate, Jody Wilson-Raybould, ahead! The Environics polls has the Liberals at 35%, ahead of the NDP at 33% and the Conservatives at 28%. To be fair, the previous two Environics polls did have the NDP ahead (and the CPC third every time, which begs the question as to why this riding is even included on their list). Another poll, however, done by Mainstreet, shows results much more in line with what we would expect: Liberals way ahead at 44%, NDP at 28% and Tories at 20%. On a side note, my projections have all been very close to the Forum and Mainstreet riding polls, but not the Environics ones. Add to this the fact that most projections, including mine, have the Liberal ahead. Why? Because according to the transposed votes of 2011 in this new ridings, the Liberals would have finished only 5 points behind the Tories. Given the provincial swing, it'd be shocking for the Conservative candidate to win. So, let's summarize: projections have Liberals ahead and Tories third. The latest two polls also show that, including one with a big Liberal lead, and somehow Lead Now is telling people to vote NDP? Surely I can't be the only one finding this weird. And of course I'm not. Lead Now is being accused of NDP bias and many people are criticizing their recommendation. I'm not even gonna really argue who is leading there, NDP or Liberals. I personally believe the Liberal candidate is ahead. But that's beyond my point. My point is that in a riding where the Tories are third and all three parties have a chance, it's really irresponsible to make such a recommendation. And it goes completely against what the people from Lead Now have said during this campaign. We all heard the horror stories that happened to some during the advance poll weekend. I personally had to wait a good hour here in Vancouver to cast my ballot. With a 71% increase over the advance poll turnout in 2011, advance polls were a great success. Election Canada has published the preliminary number of voters in each riding. So I decided to take a look and see if I could find any trend or pattern. For instance, given that the Liberals are on the rise - and this rise really started right before the long weekend - I was wondering if some ridings saw a higher turnout than others (for instance ridings won by the Conservatives or Liberals in 2011). I thus estimated an advance voter turnout, similarly to what Global did with this map. And I then tried to find relationship with multiple variables. Specifically, I looked at whether advance turnout was higher in ridings won by a specific party in 2011. Or in ridings currently projected Liberals, NDP or Tories. The last part was to see if maybe the Liberals were good at getting the vote out in ridings they can expect to gain. I also looked at the turnout in 2011. The results? The only variable that is significant is the turnout in 2011. Specifically, the higher the turnout was, the higher the advance turnout this year. Which is kind of expected. The effect is in the magnitude of 30%. In other words, a riding that had a turnout of 50% in 2011, compared to one with a turnout of 40%, will have an advance turnout higher by 3 percentage points (so 14% vs 11% for instance). This effect is slightly stronger in Quebec. Here is the advance turnout and general turnout in 2011 (note: I did an average of the ridings, so my numbers can be slightly off because I'm giving the same weight to each one when I shouldn't. But this is honestly a lot easier and doesn't change the results much. For instance, notice I get a turnout of 60.5% in 2011 when it actually was 61.1%; Also, I'm using the transposed results on the new map). The consistency is actually remarkable. To the point that I had to double check my data twice to make sure I didn't make a mistake. I tried to see if there could be effect by looking at one province only. In Ontario, I find that the advance turnout was slightly higher among CPC ridings than among Liberal ones (15% versus 14%) or NDP ridings (13.2%). In Quebec, Liberal ridings also have a slightly lower advance turnout compared to Tories or NDP and similar to Bloc held ridings. So, can we say anything? Should we expect Liberal ridings to have had a higher advance turnout if there is a really a "Trudeau wave"? Or should we actually expect CPC held ridings to see the biggest increase as people there want to change MP? Your guess is as good as mine. Just know this: in 2011, I also couldn't find any real effect between the turnout and who won the riding. There might be other effects in play but if that's case, it's probably subtle.